This is a great go-to gift that is sure to be used and admired! Perfect for housewarming, wedding anniversary, and holiday gifts! 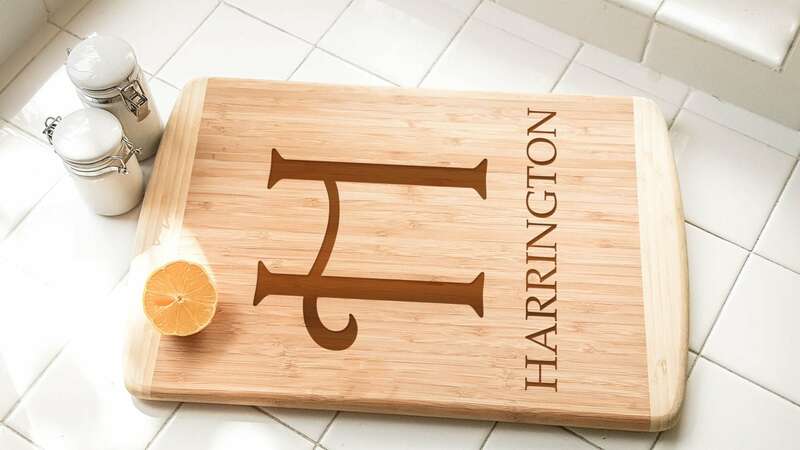 Our laser engraving experts will etch your customization onto our modern, two-tone bamboo cutting board. Made of high quality bamboo, this is a heavy duty cutting board perfect for people who love to cook and host parties! We recommend displaying the engraved side, and using the opposite side to cut. Please remember to double check the information submitted for accuracy. We will engrave exactly what you typed and cannot accept returns on this personalized product (except in the rare case that an error is made on our end). - Size: 18" x 12" x0.75"
- Color and grain of bamboo may vary. - Color and depth of engraving may vary from example photo. Did you know? Wood is the traditional material for 5th year anniversaries! Discount is available when purchasing 10 or more Factory eNova products. If you have any inquiries about our listings, please feel free to message us!